"All your vegetables had a Mexican hand on it. All your fruit, and three quarters of your meat." George Marks' Clarksville-area farm has been in the family since 1899, when it produced tobacco, corn and wheat. George's father Arthur started the dairy production, one of few dairies still operating in Montgomery County. George and other family members still own the farm, but George runs its current crops, which include corn, wheat, soybeans, tobacco, beef and dairy. 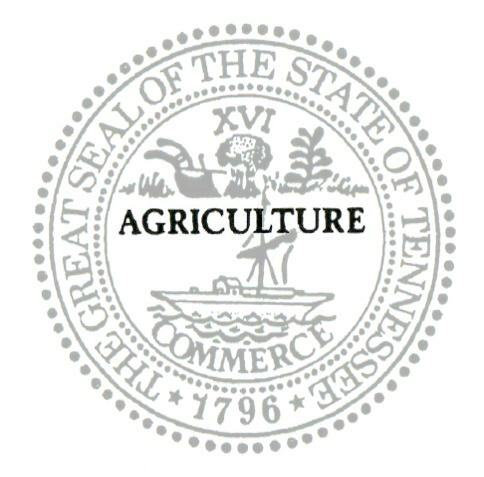 The Marks farm has been recognized as a Tennessee Century Farm, and Marks credits the sustainability of many of its products to 19 farmhands from the Pacific coast state of Nayarit, Mexico. Most of these providers (for their families and for Tennessee families) have been returning to work for Marks year after year, on seasonal visas, for over a decade. Three employees were identified in the Tennessean story: Pedro Peña, Lupe Villegas, and Pedro Mateus. 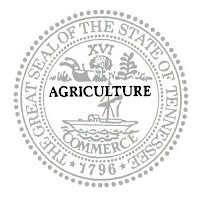 In addition to his farming duties, Marks is active in leadership and service for the Farm Bureau, the Montgomery County Cooperative, the Clarksville-Montgomery County Regional Planning Commission, and the Burley Stabilization Corporation. 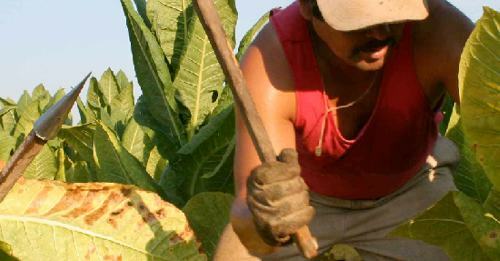 According to Bread for the World, "[a]lmost three-fourths of all U.S. hired farm workers are immigrants, most of them unauthorized. The U.S. food system—particularly fruit and vegetable production—depends on immigrants more than any other sector of the U.S. economy." Marks put it this way to the Tennessean: "All your vegetables had a Mexican hand on it. All your fruit, and three quarters of your meat." Thank farmers and their teams for the food they provide your family - just fill out the form at the TN Farm Bureau web site tnfarmbureau.org/thankafarmer. Here is what I submitted: Before each meal, my preschool son starts saying grace by putting his hands in the air and singing, "Open, shut them / Open, shut them / Give a little clap / Open, shut them / Open, shut them / Fold them in your lap," and then "God our Father, once again, we bow our heads to thank you, Amen." I thank God for abundance of the land, the animals, the farms and the farmers, and for all of their teams on those farms who put in the hard work that puts food on our family's table. Fifty-one years ago today in the Dominican Republic, sisters Patria, Minerva, and Maria Teresa Mirabal were brutally murdered by orders of their then-government leader, Rafael Trujillo, also known as el jefe. The sisters were known by their supporters and revolutionary colleagues as las mariposas ---the butterflies. These brave sisters helped initiate a road to justice and equality in their small island country that had been under the rule of a vicious dictator for nearly 30 years. During his reign of terror, it is estimated that Trujillo had tens of thousands of people murdered for opposing his government and his desire to eradicate neighboring dark-skinned Haitians from the island. Because of the valiant effort and tragic death of the Mirabal sisters, many countries in Latin America recognize today, November 25, as the International Day for Elimination of Violence Against Women. 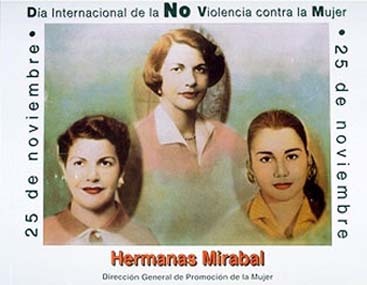 Thus, on this post-Thanksgiving Day, I encourage us all to take a moment of silence - in remembrance of the Mirabal sisters who lost their lives on November 25, 1960, and in remembrance of the thousands of lives who have been both directly and indirectly impacted by violence towards women. To honor these women and the women in your life, wear a butterfly today and share this story or your own story with others. Clergy for Tolerance is hosting a special breakfast in Nashville next Wednesday, November 30, 2011, featuring United Methodist Bishop William Willimon, head of the North Alabama Conference and leader in the faith community’s opposition and response to Alabama’s immigration law. The breakfast is meant to update faith leaders on the constantly evolving immigration bureaucracy in the federal government and in states like Alabama, and to encourage them to continue serving as spokespersons of compassion and reason. Bishop Willimon will specifically address the importance of clergy involvement in preventing similar legislation from passing in Tennessee and will provide examples of the challenges for faith communities in Alabama under this new law. Alabama's HB 56 went into effect on September 29, 2011 and is widely considered the toughest-in-the-nation legislation on the targeted workers. Also speaking will be Robert Parham, Founder and Executive Director of the Baptist Center for Ethics. Reared in Nigeria as the child of missionaries, Parham has a doctorate from Baylor University, a master's of divinity from Southern Baptist Theological Seminary, and a bachelor's in foreign service from Georgetown University. In addition to appearing on Fox News, CNN Talk Back Live, MSNBC News Chat, ABC World News Tonight and NPR’s Morning Edition, he interfaces with reporters across the country. Parham will introduce the topic of faith and immigration within a framework of morality. Organizers say that 180 Tennessee clergymembers and faith leaders are scheduled to attend, but space is still available for registration. On October 22, the Martínez Vargas family celebrated the fifteenth birthday of Isis Abigail with a thanksgiving mass at Our Lady of Guadalupe Catholic Church, where the quinceañera was accompanied by her escorts Brayan Martínez, Óscar Vivas, Edmundo Díaz y Caín Honorato. Afterward, guests attended a reception emceed by Kaimanes Musical at Premier Indoor Sports. Advance photos were taken at the Opryland Hotel. 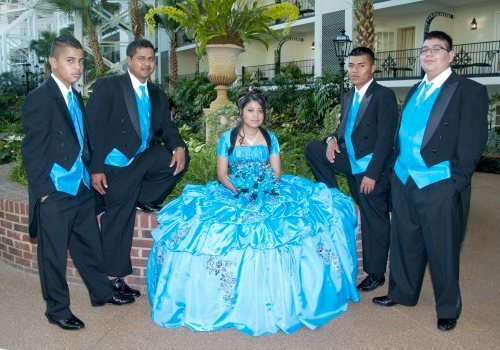 See more quinceañera announcements at HolaTN.com. Original story credit: Vallejo y Alcántara/HolaTN. 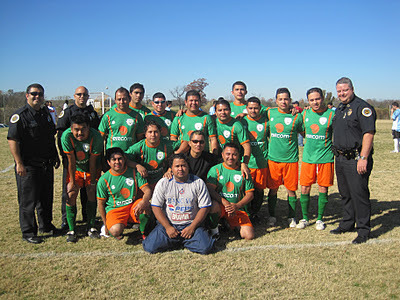 English summary by HispanicNashville.com. Used with permission. The Kings of Salsa are playing at the Schermerhorn Symphony Center this Tuesday night, November 22, at 7:00 p.m. Tickets are $29-$69; to purchase, click here or call 615-687-6400. Choreographed by Roclan Gonzalez Chavez, this stunning new show pays homage to the great Cuban performers and the dance styles from this intoxicating island, with a cool contemporary modern twist showing young Cuba today. Regarded as one of the best young choreographers in Cuba, Gonzalez Chavez has created this show to feature the unique talents of some of the island’s best dancers, picked from the cream of Cuba’s top dance companies. The electrifying mix of performers and choreographic styles makes this a show not to be missed. Featuring the very best of Havana’s cool street salsa and hip hop scene, Kings of Salsa seamlessly mixes traditional Afro-Caribbean moves, world class contemporary dance and the Cuban classics: Mambo, Rumba, and Cha Cha Cha. Backed by the spectacular 9-piece band Cuba Ashire, who unleash Latin rhythms and stratospheric brass arrangements, Kings of Salsa showcases a slice of cool contemporary Cuba never seen before on stage. If you loved Buena Vista Social Club, you do not want to miss this evening! Four free tickets are available to HispanicNashville.com readers - to enter, just post a comment to this story below (or on Hispanic Nashville's Facebook page) and say how many tickets you need. Comments must be posted by 12:00 p.m. (noon) on Monday, November 21. Photo by Michael W. Bunch © Nashville Scene. Used with permission. 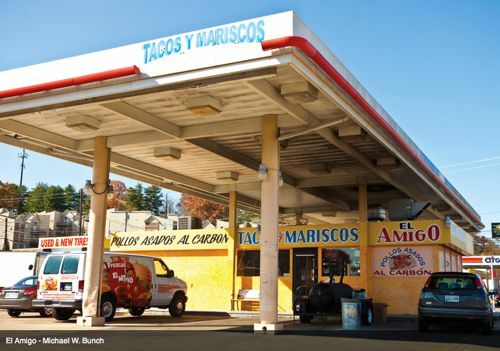 Nolensville Road and taco shop El Amigo get a love letter for their food, in this week's pre-Thanksgiving edition of the Nashville Scene. The piece by Sean L. Maloney is part of a cover story made entirely of open letters to "the city we love, the people we admire from afar and some other stuff we generally find tolerable about life, all in an open forum." First and foremost, I’d like to thank you for smelling like meat at almost all times. Specifically, meat cooked over low heat for hours on end. That could be my favorite scent in the whole olfactory spectrum, and nothing says “we’re home” to my wife and me after a long trip like the whiffs of barbacoa and al pastor that waft into the car once we get off the highway on the way back to nuestra casa. [N]ow that we’ve traded in our 500-square-foot yuppie cage for five rooms on the South Side, we’re eating like champs for half the cost. And the options! Even if we’re being super-duper lazy and don’t want to go past the end of our street, we’ve still got a globe’s worth of options: Ghanian over at Musaake, the best chicharron de queso papusas in town at La Papuseria Salvodoreana, grocery stores featuring the fare of at least four continents! 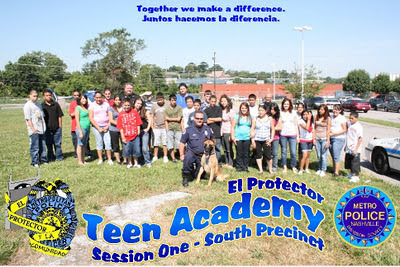 Nashville's nationally acclaimed El Protector Program turned seven this year, interacting in one way or another with the infants, youth, and adults across the Nashville community. Metro Nashville Police Department Commander Mike Alexander, who was recently awarded the “Building Neighborhoods Award” by the Nashville Area Hispanic Chamber of Commerce, describes El Protector as "building trust and partnership between the police department and the Hispanic community." The El Protector Program began in 2004 and originated within the South Precinct as a means to provide outreach and partnership between the police department and the Hispanic community. The program now has two sworn officers dedicated to this effort who are Gilbert Ramirez (South Precinct) and Rafael Fernandez (Hermitage Precinct). We have three events that we consider the most crucial during the year, which are the Hispanic Community Festival, Hispanic Teen Academy and Soccer Tournament, and a Christmas event for disabled children in December. 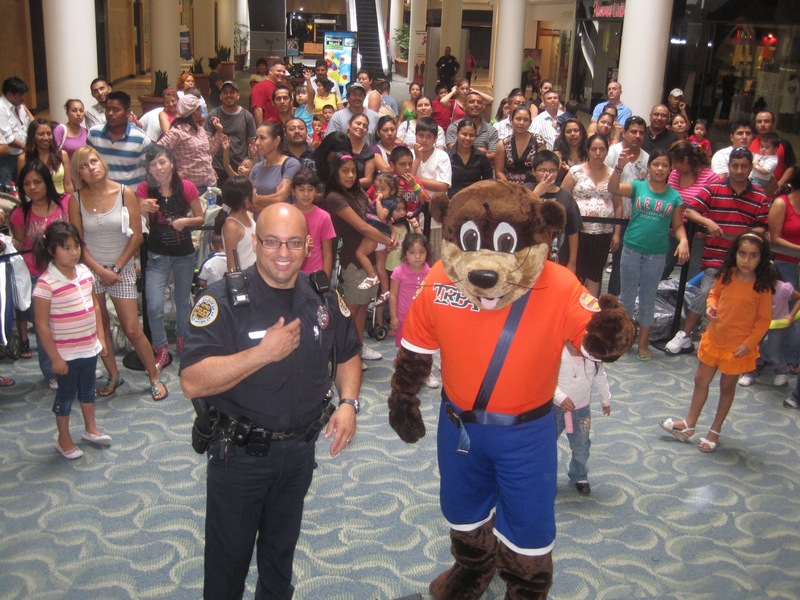 The El Protector Program is successful due to very committed partners and organizations within the community who are willing to work with us to make our city a safe and welcoming environment for all. We have a great relationship with Cricket Communications as they provide approximately 40 cell phones to civilian translators who are on call to translate for the officers in the field. We have recently added Hispanic clergy members to our Police Youth Response Team who are on call to assist with any serious events where Hispanic youth may be injured, in order to counsel family members. Our officers are now on two radio stations each week and take calls from the community regarding a variety of issues in terms of laws, how the police department operates. The sessions are open to callers who call in to dialogue and/or ask questions related to a variety of topics. [The radio] is a great opportunity for interaction with the El Protector Officers, to educate and learn more about the department and existing laws. The South Precinct has been designated as the first Hispanic Car Seat Safety Inspection Site in the state of Tennessee, and our El Protector Officers (through a partnership with Meharry Medical College) conduct car seat safety inspections for families to insure that children are as safe as possible in vehicles. The program has been recognized by the Vera Institute in New York as one of the six best practices in the country as it relates to bridging the language divide. Vera began with the assessment of over 200 police departments across the country and then made on site visits to approximately 25 agencies (of which we were one) and then selected who they believed were the six best. We are currently in contention again for this recognition. We must be proactive in terms of reaching out to the community in order to build trust and partnership as we work together for a safe and peaceful Nashville. El Protector's accolades, track record, and interactions with Music City have been documented over the years in HispanicNashville.com. To see those stories, click on the "El Protector" link in the Index on the right-hand side of this site. I sit in the lobby waiting for Pastor Rolando Rostro to finish the last proclamation of the Quinceañera ceremony. “Felicidades a la princesa del dia…” The children too young to sit are playing in front of me, switching with ease between English and Spanish, running in circles around the rug. When Rolando finally emerges, he leads me down a long hallway to the heart of his Iglesia Nueva Vida, the pastor’s office. Rostro, originally from Rio Verde, San Luis Potosi, Mexico, immigrated with his parents and 9 siblings to Brownsville at the insistence of his mother. He and his family grew up working as pickers in the fields of South Texas, dodging the authorities. “We always had a fear of being questioned and discovered. We were intimidated, mentally unsettled. That fear creates dangerous conditions. People are afraid of going to the police, checking into a hospital, or dealing with any kind of bureaucracy. These services are in place to help people, not scare them away.” As a result, domestic abuse was rampant and “most crime went un reported in the neighborhood” during his childhood. The Immigration Reform and Control Act, commonly known as “amnesty" or “legalization”, was passed by Congress and signed by President Reagan on November 6, 1986. Rostro recounts an incident shortly after that, when his mother was pulled over with him and his siblings in the car. “The officer asked us for identification and my mother took out all 11 social security cards, handed them to him one by one. That was a big moment for us. It created confidence and a freedom to open up to the authorities.” Although the law changed his legal status, it did not change popular opinion. “Laws don’t change popular opinion, taking personal action by opening your mouth does,” says Rostro, whose mother forced him and his siblings to learn English early. These verbal skills have served him well in the years since then. 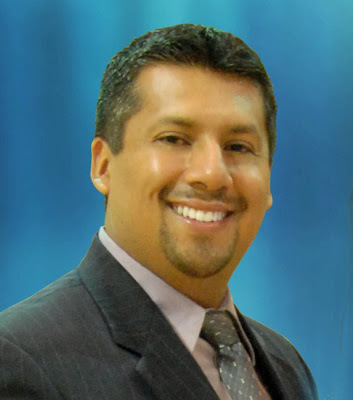 Rolando has become pastor of his own Memphis church, President of the Hispanic Pastor Network, and a leading provider of Spanish translators to the 911 emergency system. In 2001 he participated in La Coalición Memphis, a group of a dozen individuals who lobbied successfully for the passage of a Tennessee law that enabled undocumented aliens to obtain driver’s licenses. “These are good people, working people. Give them a way to be included, to participate and assimilate into the system, to generate revenue and pay their dues. You want to be able to ID them out in the open, not to have to search for them in hiding.” Rostro believes that including immigrants can benefit the economy in the form of taxes, administrative fees, and traffic fines. “Whatever they charge, they will pay,” he states flatly, citing the overnight appearance of long lines at driver’s license centers as soon as the licenses became available. According to Rostro, the future for today’s Hispanic immigrants is unclear, but “there’s always a fear of immigrants and there will always be opposition.” This opposition is fighting a tide that grows stronger everyday, a growing community that he believes will throw considerable weight behind the next presidential candidate who favors pro immigrant legislation. “The first generation doesn’t speak English or vote, but their children and grand children do. The next candidate who proposes something similar will win the Hispanic vote. It will happen again. Not this term, maybe next, or the one after. Without that law, I wouldn’t be educated. I wouldn’t have been able to provide private education for my kids, or give them the confidence, opportunity, and peace of mind to do something productive”. 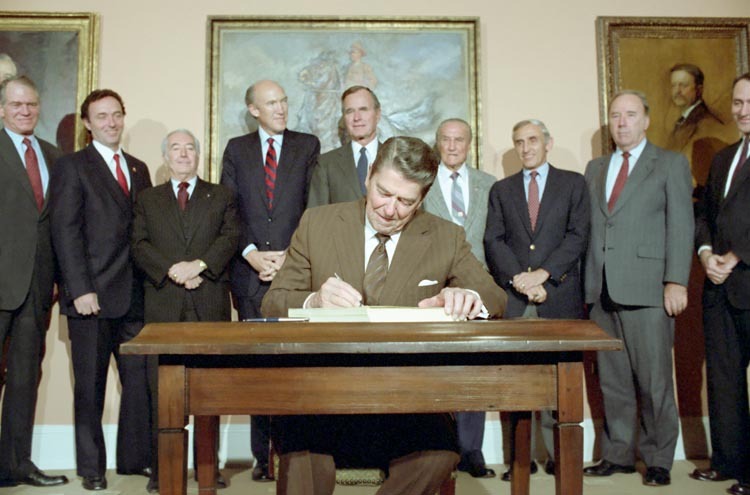 This is the fifth and last story in a HispanicNashville.com series on the Reagan amnesty bill signed 25 years ago. The first piece in the series was by Cindy McCain, titled "'Manuel' remembers November 1986;" the second was last Friday's story/opinion piece "25 years of my own spiritual amnesty;" the third was a Thanskgiving-themed PSA called "Founder of the Feast," featuring a picker in the field, like Rostro and his family; the fourth was a guest post of mine called "Reagan’s Amnesty Bill Impacted Families for the Better" that was published on the web site undocumented.tv; and this story by Ralph Noyes about Rolando Rostro is the fifth. Manuel Cuevas ("Manuel" for short) was honored Sunday with a star in his name on the Music City Walk of Fame. Manuel is one of Nashville's music legends by way of fashioning many musicians' iconic outfits. 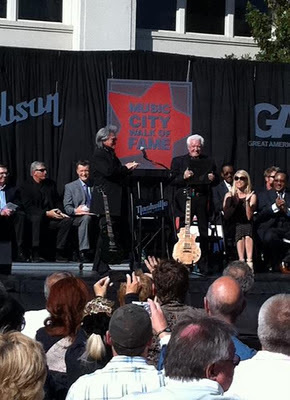 See Manuel's official bio on the Walk of Fame site here, and photos of the ceremony and the actual star at the Tennessean or on Manuel's Facebook page. 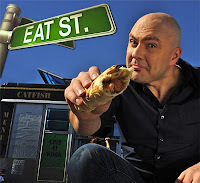 At lunchtime on Friday, you can be on TV - and eat well in the process - at a taping of Food Network Canada's "Eat Street", which will be featuring Nashville mobile food truck Yayo's O.M.G. ("Original Mexican Gourmet"). 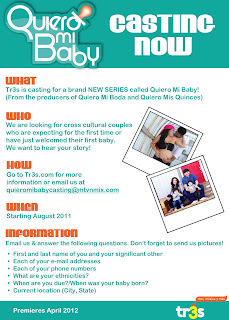 Filming will take place from 12:00 p.m. to 2:00 p.m. outside the offices of Conexion Americas, 800 18th Ave So. If you want a little more camera time and are expecting your first child between now and February, MTV Tr3s is looking for Nashville couples for a new documentary “Quiero Mi Baby.” From the producers of “Quiero Mis Quinces” and “Quiero Mi Boda,” Quiero Mi Baby will feature cross-cultural couples (for example Puerto Rican & Italian or Cuban & Venezuelan) who are expecting for the first time. A trailer for the show is here, and the casting link is here. Here's my PSA or "house ad" for Thanksgiving 2011. It's a play on the country/Southern phrase "Dance with the one that brung ya," which is about loyalty to the people who got you where you are today. 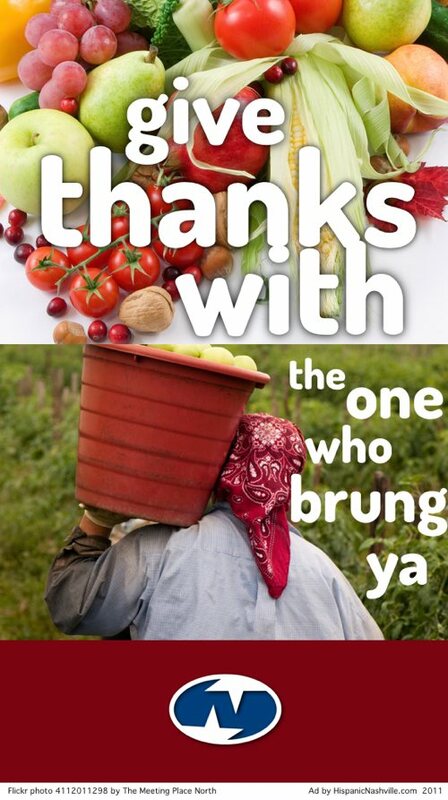 May we be thankful for and with, and loyal to, every person who brings us our food. See the other ads I've created under "Ads" in the Index on the right-hand side of this site. Twenty-five years ago, I received amnesty. It was June. I was thirteen. I was with my youth group in Greenville, South Carolina, on a university campus - North Greenville University, I think - not Furman, and definitely not Bob Jones. The campus had been rented out by a Southern Baptist youth camp program called Centrifuge, and we were there for the week. For the previous six years or so, I had been aware of the concept of a making a lifelong spiritual commitment to God - to Jesus. In the Baptist world and elsewhere, making that commitment is alternately described as committing your life to Christ, going down the aisle, getting saved, or getting born again. The idea is that you recognize your general pattern of doing things wrong in life, and your separation from God, and that you ask for an unearned (by you) reconciliation to God. I was thirteen, and I really was aware of my shortcomings. I don't look back now and think that such an attitude at that age was silly. It's actually sillier that 25 years later I am less aware of and repentant of my shortcomings. But getting back to 1986, there I was, ready to make that spiritual commitment, and I called my youth pastor Harry Rowland aside. I told him, although not in so many words, that I wanted to receive amnesty. He thought that I had already done this, and I explained that I hadn't, and that was that. We spoke with my parents. We must have spoken with pastor Bill Sherman. And then, days later, at Woodmont Baptist Church, we all marked this significant spiritual reboot with my baptism. The wrong thing to do would be to forget that it happened. These instructions to fear and tremble were directed at people of God - insiders, not outsiders. Sometimes it feels like Americans, many of whom self-identify as Christians, have a sense of entitlement (even those who would otherwise complain about "entitlements"). We are the ones in the right, we think, and someone else is in the wrong. Funny how it almost always turns out that way. As a result, we are more inclined - individually, collectively, politically, spiritually - to inflict fear and cause trembling. And we sure do resent it when someone inflicts it on us. But to choose to fear, to choose to tremble, with no outside enemy the object of our fear? Since it's the 25th year of my own amnesty and the 25th year following the immigration amnesty of Ronald Reagan, I think of how we have very little national fear and trembling about how our law treats immigrants. We have little fear and trembling about how we as American Christians readily accept spiritual forgiveness and even legal forgiveness, but we deny legal forgiveness to the foreigner, especially those in poverty who make up the bulk of the population without papers. We have little fear and trembling about spiritual instructions to us to take extra precaution to give justice to the poor and to the foreigner. For if you forgive others their trespasses, your heavenly Father will also forgive you. I mean, for crying out loud, that's the first thing out of Jesus' mouth after He sets out the model prayer to God. To America's credit, Ronald Reagan signed one such forgiveness of trespasses. That was twenty-five years ago this Sunday - November 6, 1986. But who is God going to hold accountable for America's national refusal to forgive immigrants since then? There are ways for America to grant measured, reasonable amnesty that make plenty of legal and Constitutional sense in the same way we provide amnesty to ourselves as Americans in other contexts. But the politicians don't want to do it. And here we are, with millions in the lurch. When God calls America to the mat for denying justice to the foreigner, the politicians are going to be pointing fingers at us, and we're going to be pointing fingers at them. You don't have to be a parent to know how badly that is going to end. America needs amnesty, and not just for the so-called "them." We have arrested pregnant mothers under claims of driving offenses that don't stick. We have used vocabulary as a weapon. We make our own conduct consequence-free. We are flirting with lynchings. We are living in the modern version of the Chinese Exclusion Act. We condone "amnesty" but we have no problem receiving it. We overlook the lawbreaking of the powerful while we condemn the lawbreaking of the poor. We have "fresh starts" for ourselves but not for others. We don't talk to people before we form opinions about them. We ignore the voices echoing Martin Luther King's cry for moral, just laws. As for me, I will try to remember my own missteps, acknowledge my new ones, and seek correction - all in fear and trembling, as I give thanks for and continue to ask for my own spiritual amnesty. As we talk about, watch, and write (or withhold) laws on immigration, either in Congress or in statehouses and city halls across the country, may we remember our own missteps, acknowledge our new ones, and seek correction - all in fear and trembling, with our own need of forgiveness front and center in our hearts and on our minds. I was at my job…a little restaurant where I worked while in school. They’d been trying to pass the law for awhile. They had a tv on and we heard President Reagan had signed the bill. The Spanish people were very happy. Some of them were crying. It was very emotional. Some were clapping. Some were screaming very happy screams. Manuel (name changed for privacy) recalls the reaction he witnessed on November 6, 1986 to the passing of the Immigration Reform and Control Act (IRCA). It opened doors of opportunity. You could buy a house, go back and see your family. It was the best news ever. Back then I knew people who had been here (in the U.S.) twenty years that hadn’t been able to go home to visit family. After ‘86 you could get a temporary green card to travel back and forth. There was this guy who’d been here forever. When he heard the news, he applied to get his card and went to Mexico for a month. IRCA gave amnesty/legalization to undocumented people in the U.S. who had entered the country before 1982 and had lived here continuously. Manuel was here legally on a student visa, but when he graduated from college in 1989, he would be required to leave. He believes had it not been for the amnesty he would have returned to Mexico, something he didn’t want to do, and lived another life. But that night -- almost 25 years ago -- gave him confidence to hire an attorney and seek permanent residency. Dad worked for Proctor and Gamble in Mexico City which sponsored a scholarship for me to study in the states based on good grades. When I was 15 my father asked, 'Do you have the courage to leave home?' I said yes. I wanted to explore something different. After high school he returned home, them came back to attend Ranalto Santiago College in Santa Ana, California. From there he graduated with a degree in Culinary Arts. He paid for college working in his uncle’s restaurant and for a time sold Oakley sunglasses. When he had a family of his own he moved them to Nashville so his son’s mother could be near her family. That was fourteen years ago. Today Manuel is Assistant Food Manager in charge of catering for the President at a Middle Tennessee university. Monday-Friday he works 7-2:30, then heads to his second shift from 4:30 until closing where he’s on a sales marketing team for an award-winning restaurant in downtown Nashville. When asked about working until midnight, he smiles and says he feels thankful: “They are a great company to work for. I have two jobs, but some people don’t have that.” He’d love to open his own catering business one day. In my opinion, criminals and people who are trouble—send them back. Let good people working already continue working. Alabama farmers are complaining that they don’t have enough people to work their fields which hurts the economy. A law that profiles people suspected of being illegal because of the color of their skin would be very sad. I barely made it. I was pretty lucky. I came into the country in 1982, but because I did it legally, and because of the 1986 Act, it was easier for me to get permanent residency. Since then, my hero has been President Reagan. It’s [IRCA's] one of the remarkable things he did for Spanish people. If I’d stayed in Mexico I’d probably be working for my brother’s business and have a whole bunch of kids. When I moved away I became so independent. It helped me a lot. I can make my own decisions. Opportunities are here. I’m not under my parents’ wing. It makes me more mature and independent. I love America. It’s my son’s country. Now I plan to apply for my American citizenship…so I can vote. Photo by Orlando Rob. Licensed via Creative Commons. Because today is also the start of NaNoWriMo, National Novel Writing Month, my post today will be a humble attempt at creative writing - inspired by the Liberty Bell, its historic inspiration, and its promise for America. This fictional piece is about the ratification of a theoretical 35th Amendment to the Constitution granting citizenship to anyone and everyone who has lived in the U.S. for twenty-one years. 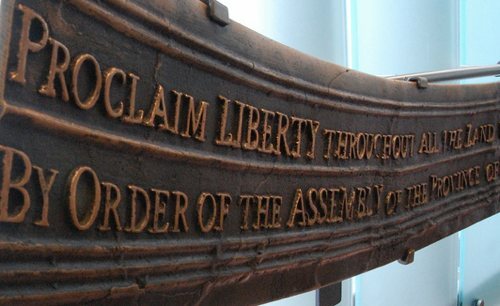 It represents jubilee, and liberty. Perhaps it is in our future, or perhaps not. You can peek into that world (and into my very rough skill set of creative expression) in the rest of the post, below.